I tried not to spoil the first two books of the Hypnotists series, but it's pretty hard to review the third book in a trilogy without ruining something from the preceding books. If you have never read any of the Hypnotists books before, get off this page right now. Here, why don't you check out the first book on Goodreads? The government has promised to protect Jax Opus and his family from enemies that want to use his hypnotic power to bring more evil into the world. Jax has reluctantly agreed to be protected. But protection has its price -- and soon Jax learns that if the government is going to help him, it's going to want some help in return. The reach of Jax's hypnotic talents is especially dangerous because he doesn't have to be looking at people directly to control them. No, he can hypnotize people through video broadcasts -- so a person can be innocently checking a computer, and suddenly have a hypnotic message planted. Even worse? Jax is not the only person who can do this. He is up against a hypnotic mastermind who has more than a few tricks up his sleeve. It's a race against time and the power of evil in this heart-stopping adventure from #1 New York Times bestselling author Gordon Korman. Rather cheesy covers aside (honestly, just look at that green block text - did someone tell the cover artist The Dragonfly Effect was a horror novel?! ), the Hypnotists books are great MG reads, and I've enjoyed reading them. 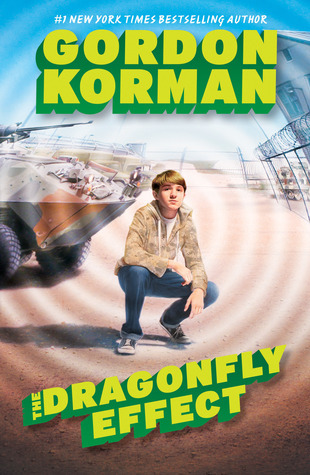 If asked, I would have chalked my enjoyment for the first book almost entirely up to Korman's writing rather than the story itself, because it felt a little too much like other MG books about kids who discover they have powers. The second book, Memory Maze, continued to have Korman's uniquely compelling writing style, but also delved into some of the implications of hypnotism, going into the psychological effects it had on Jax. With The Dragonfly Effect we continue to explore the (sometimes horrifying) uses for hypnotism, the ethics involved in letting an organization like the military use hypnotism for their own ends, and the very real pain that can spring from the misuse of such power. I think my favorite thing about this trilogy is that it never treats hypnotism like this awesome get-out-of-jail free card - no, that's not right. It's a get-out-of-jail free card, yes, but it's also the card that puts you into jail in the first place. Jax's hypnotism is pretty much just a curse for him, because it forced him to flee for his life and go into hiding. His parents, who love him dearly and readily sacrificed their entire careers for Jax's safety, are terrified of looking into his eyes because he might accidentally hypnotize them. The "gift" that Jax has comes at a terrible cost, and that cost is safety, peace of mind, familial trust, and, basically, childhood innocence. Mako is an interesting villain because his innate skills are supposed to be weaker than Jax's, and yet he always seems so much stronger. This comes from the sheer ruthlessness with which he brandishes the ability, doing whatever it takes to reach his goals no matter who gets hurt in the process. That sort of cruel single-mindedness makes him a huge threat to Jax, because Jax is a genuinely good kid who is much too nice for his own good. I liked the almost Harry-Potter-esque contrast between good and evil there, especially with the addition of a third major party in the stand-off (whom I won't name for fear of spoilers - but for those of you who have read the book: I really loved him/her!). In a perfect world, one in which The Dragonfly Effect was a longer book, I would have liked to learn a little bit more about Mako's history. Was he always such a terrible person, or did something happen to make him that way? There could have been a fascinating (and probably heartbreaking) story there, but instead we just got the pretty much one-dimensional villain with a crazy evil scheme that would (as far as I can tell, anyway) hurt him as much as it did anyone else. And that brings me to the biggest issue I had with this book: the ending. Everything was just too convenient. I obviously can't talk too much about it, but why on Earth would Mako set things up so that his opponents could do what they did? For a smart man, he's pretty stupid. And the thing with the airplane was exciting, but a little contrived. As for the number of casualties? Puh-lease. Then again, this is Middle Grade fiction. And honestly, I actually really loved the way things ended. Sure it wasn't the most realistic series of events, but this is a MG book about kids with hypnotic powers. And the ending was really thrilling, with danger and excitement and a horse trotting through downtown New York. If I said I wanted a more realistic ending, I would totally be lying.